This page Nazi Germany is part of the Nazism portal. Illustration: Cover of the catalogue of the Nazi "Degenerate Art Exhibition" (1937). The exhibition was held to defame modern and Jewish artists. On the cover is Der Neue Mensch sculpture by Otto Freundlich. Nazi Germany, also known as the Third Reich, is the common name for Germany during an era where the country transformed from a democratic Republic to a totalitarian state, being ruled by Adolf Hitler as the leader of the National Socialist German Workers' Party (NSDAP) until their destruction by Allied Forces in May, 1945. In the midst of the Great Depression, the Nazi government restored economic stability and ended mass unemployment using heavy military spending and a mixed economy of free-market and central-planning practices. Extensive public works were undertaken, including the construction of the Autobahns. The return to economic stability gave the regime enormous popularity. All opposition to Hitler's rule was suppressed. Racism, especially antisemitism, was a feature of society in Nazi Germany. The Gestapo (secret state police) and SS under Heinrich Himmler destroyed the liberal, socialist, and communist opposition, and persecuted and murdered Jews and other "undesirables." According to a 19th century anthropological theory, the Germanic peoples—who were also referred to as the Nordic race—were the purest representation of the Aryan race, and were therefore the master race. Education focused on racial biology, population policy, and physical fitness. Membership in the Hitler Youth organization became compulsory. The number of women enrolled in post-secondary education plummeted, and career opportunities were curtailed. Calling women's rights a "product of the Jewish intellect," the Nazis practiced what they called "emancipation from emancipation." Entertainment and tourism were organized via the Strength Through Joy program. The government controlled artistic expression, promoting specific forms of art and discouraging or banning others. 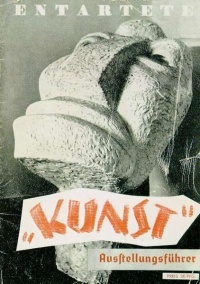 The Nazis mounted the infamous Entartete Kunst (Degenerate Art) exhibition in 1937. Propaganda minister Joseph Goebbels made effective use of film, mass rallies, and Hitler's hypnotizing oratory to control public opinion. The 1936 Summer Olympics showcased the Third Reich on the international stage. Germany made increasingly aggressive demands, threatening war if they were not met. Britain and France responded with appeasement, hoping Hitler would finally be satisfied. Austria was annexed in 1938, and the Sudetenland was taken via the Munich Agreement in 1938, with the rest of Czechoslovakia taken over in 1939. Hitler made a pact with Joseph Stalin and invaded Poland in September 1939, starting World War II. In alliance with Benito Mussolini's Italy, Germany conquered France and most of Europe by 1940, and threatened its remaining major foe: Great Britain. Reich Commissariats took brutal control of conquered areas, and a German administration termed the General Government was established in Poland. Concentration camps, established as early as 1933, were used to hold political prisoners and opponents of the regime. The number of camps quadrupled between 1939 and 1942 to 300+, as slave-laborers from across Europe, Jews, political prisoners, criminals, homosexuals, gypsies, the mentally ill and others were imprisoned. The system that began as an instrument of political oppression culminated in the mass murder of Jews and other minorities in The Holocaust. Following the German invasion of the Soviet Union in 1941, the tide turned against the Third Reich in the major military defeats of the Battle of Stalingrad and the Battle of Kursk in 1943. The Soviet counter-attacks became the largest land battles in history. Large-scale systematic bombing of all major German cities, rail lines and oil plants escalated in 1944, shutting down the Luftwaffe (German Air Force). Germany was overrun in 1945 by the Soviets from the east and the Allies from the west. The victorious Allies initiated a policy of denazification and put the surviving Nazi leadership on trial for war crimes at the Nuremberg Trials. Unless indicated otherwise, the text in this article is either based on Wikipedia article "Nazi Germany" or another language Wikipedia page thereof used under the terms of the GNU Free Documentation License; or on original research by Jahsonic and friends. See Art and Popular Culture's copyright notice. This page was last modified 21:24, 9 March 2015.